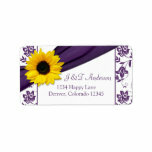 Pretty and cheerful yellow sunflower, violet purple damask floral wedding invitation. 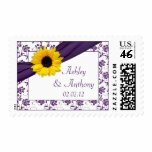 The text is easy to personalize using the tools on the Zazzle website. 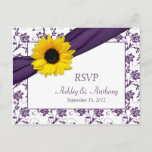 Pretty in yellow and purple, this would make a great invitation for a summer or fall wedding with a sunflower wedding theme. 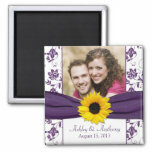 Additional paper types to choose from on the Zazzle website.